Chad Lewis started compiling his book, “Hidden Headlines of Wisconsin: Strange, Unusual and Bizarre Newspaper Stories 1860-1910,” almost by accident. He dug through the Eau Claire newspaper’s archives, looking for a date and noticed lots of “weird” news stories. “RIVER FALLS- On the farm of Mr. Johnson, four miles north of River Falls, is one of the most peculiar pyramids to be found in the state, if not in the United States. It is a huge monument 45 feet across at the base, and 65 feet high, and looks as though it has been formed and fashioned by the hand of man. There is no other stone or rock formation in the immediate neighborhood. Lewis, coauthor of “The Wisconsin Road Guide to Haunted Places,” said he likes the odd, unusual and strange. He found the book research fascinating. Intrigued, the Journal sought and found what’s known around River Falls as “The Monument.” Although some information exists at the UW-River Falls archives, people generally don’t know a lot about the monument’s history. The River Falls Public Library displays a nice, clear picture of it, and employees say they get lots of questions about it. Some estimate it to be the most asked-about item in River Falls history. 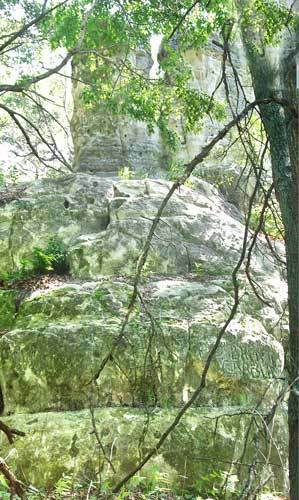 While dense woods surround it today and time has eroded some of its detail, the monument is definitely real, still there, and probably not formed naturally. 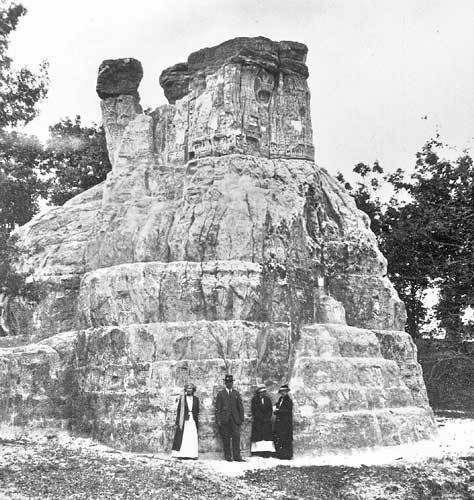 The 1902 news story gives the right approximate dimensions of the monument’s size — much too big and now too overgrown to photograph in its entirety. It sits about five miles north of River Falls on private property between Hwy. 65 and Monument Road, near the intersection of Hwy. 65 and County Road J. Land owner Shirley Kurtz said she and husband Fred moved into the farmhouse near it in the 1950s. She can remember a few times in the last half century when people have gone poking around to find it. She said she doesn’t mind that but wishes people would ask her before hiking onto her land and not park cars on the road. “We just don’t want it to be defaced,” said Kurtz about the monument. Lewis said his book features eight chapters of odd headlines and stories: Bizarre deaths, ghosts, medical anomalies, mysterious creatures, oddities, peculiar people, psychic phenomena and UFOs. A girl yawned herself to death; a man dropped dead during his wife’s funeral; a white boy turned black; a pig grew elephant tusks; and someone claims to have seen a half-boy, half-dog creature. One lady made the papers after she had her dead husband’s false teeth removed and fitted for herself. He saw a story about a “spook union of mediums formed” and about bright lights or hovering disks in the sky. One of his favorite comes from Madison and tells the story of a young girl who proudly wears new shoes — made of human skin. A medical-student friend had taken the skin from a research corpse. Lewis said the friend planned to make a matching purse if she had enough skin left. He said the language in old newspapers also made his book research interesting. He said papers back then had more detail, a different style of writing and didn’t avoid gossip or advertisement in news stories. He said his book, “Hidden Headlines of Wisconsin: Strange, Unusual and Bizarre Newspaper Stories 1860-1910,” contains photographs from corresponding time periods and tidbits of information from around the state. Lewis said the book came out last Wednesday and people can purchase it from most major retailers. He said in many ways, he thinks the 163-page book brings more color to the state. Lewis welcomes people to contact him if they have more information about the odd stories in his book or to report others he may not have seen yet. Contact him at chadlewis44@hotmail.com or visit his Web site: www.unexplainedresearch.com. Contact Debbie Griffin at dgriffin@rivertowns.net or 426-1048. FAIR USE NOTICE: This page may contain copyrighted material the use of which has not been specifically authorized by the copyright owner. This website distributes this material without profit to those who have expressed a prior interest in receiving the included information for research and educational purposes.